Working onboard a yacht can be an exciting and fulfilling experience. Yet, being at sea for extended periods of time can present some dangers, from big waves, storms, mechanical issues, etc. But what many don’t realize, that there can be just as many dangers for yacht crew while docked at a shipyard. Yes, you may essentially be on “land” but all that does is raise new opportunities for accidents and tragedies. So if you are scheduled to be docked at a shipyard, be aware of the following mishaps, which can help prevent an injury, or worse. When the yacht is in the shipyard, there are many people coming onboard which can make a tight area quite crowded. People stepping all over each other, turning a corner and running into someone, there are many scenarios that can lead to an injury. Especially since the majority of the people that will be on the yacht are not familiar to the vessel’s environment. Make sure to have some caution signs to warn the crew of work in progress, or workers that are coming onboard. Being on a yacht for months at a time, you begin to know every nook and cranny like the back of your hand. Knowing everything from certain creaks, slippery areas, changes in floor elevation, can help keep you from injuring yourself. With many people coming aboard and different crews working throughout, there can be a lot of tools, hoses, drop clothes, wires, open panels, construction materials, and a plethora of other items lying around, just waiting to be tripped over. 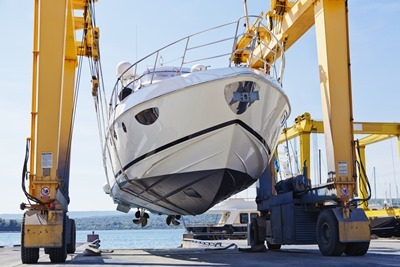 Also, when docked, there is good chance your yacht is going through an extensive renovation, which can lead to many things being moved around, and not put back in their proper places. Make sure you go around and check if everything is put back correctly, and that equipment is ready to go once cleaning has finished, and watch your step for any materials just laying around! Did you know that some people suffer from motion sickness once they’re back on land after spending a long time on a boat? When you’re on a boat for a long period of time you get used to the rocking motion and when returning to solid land, some can still feel the rocking sensation which can cause motion sickness. Take the time to obtain your land legs if you will be doing work on solid ground, this way you don’t lose your balance. Do some exercises (jumping jacks, yoga), get some sleep, or try some other stress relieving tips to help you get your legs. Usually when a yacht is docked at a shipyard, it is time for an extensive cleaning. With cleaning comes some chemicals and fumes that can be very dangerous. Have you ever heard what happens when mixing ammonia and bleach? There are also many other chemicals that can stem from your vessel being docked, from stripping varnishes, water treatments, and new urethanes. Not having the proper protection from harmful chemicals can lead to problems. Be sure to have proper gloves, masks, suits, etc. MHG is your specialized broker when it comes to crew insurance. Our insurance specialists have the knowledge and experience to find the policy that works best for you. For more information on yacht crew insurance read our previous blog, 5 Things You Should Know About Crew Insurance. If you are interested in purchasing or have any questions about yacht crew insurance or travel insurance, or would like some advice, please contact us at +1 954 828 1819 or +44 (0) 1624 678668 or visit us online at mhginsurance.com. See you at the Newport Charter Yacht Show!